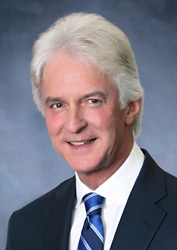 James C. Bly, Jr. was the co-founder of BGA in 2004 and served as its Co-Chairman and CEO until 2017. He remains an owner, but has now retired from active involvement on the board or management of BGA. He has been given the honorary title of Chairman Emeritus for his vision and dedication to BGA and its commitment to the important role that family controlled businesses play in our economy. Mr. Bly was also a founder of HWSC, a multi-disciplinary professional services firm started in 1982. For 35 years, HWSC specialized in providing Family Enterprise Business Services to Business Owning Families and Family Offices, which own upper middle market companies or complex portfolios of operating businesses or operating assets. Most of HWSC's clients were second through seventh generation family-controlled business enterprises. Ernst & Young, LLP (EY) acquired the Family Enterprise Business Services (FEBS) division of HWSC in 2017 and Mr. Bly is now an Executive Director of EY and practice leader in its FEBS business unit. In 2018, the direct investment services division of HWSC was merged with de Visscher & Co.’s direct investment services practice to create FODIS. Mr. Bly is Co-Founder, Principal and Chairman Emeritus of FODIS. Mr. Bly has over 30 years of experience working with multi-generational family controlled businesses and family offices and holding companies on matters related to growing larger, more valuable businesses; financing the growth of family-controlled companies while maintaining family control; completing generational transitions of operating businesses; and on designing and implementing shareholder liquidity plans. Mr. Bly has served as a Trustee, Director, Committee Member, or Advisory Board Member to various family offices, business holding companies, client-owned corporations, and business owning estates. Mr. Bly has either chaired or served on Finance, Investment, Risk Management, or Nominating and Governance Committees of the boards of various multi-generational family businesses. He was also a founder of PathNorth, a non-profit organization focused on broadening the definition of success, and is a recipient of its John C. Whitehead Legacy Award and John C. Whitehead Award for Civility. Mr. Bly graduated from St. Bonaventure University in 1973. He has been certified in mergers and acquisitions (CMAA) by the Alliance of Mergers & Acquisition Advisors and earned a Certificate in Financial Planning from the American College. He is a member of the Association for Corporate Growth, and the Alliance of Mergers and Acquisition Advisors. He has attained listing in Who's Who in Finance and Industry, Who's Who in America, and Who's Who in the World, and is a recipient of the Albert Nelson Marquis Lifetime Achievement Award by Marquis Who’s Who. He is a member of Rolling Rock Club, Allegheny Country Club, The Duquesne Club and Stonedale Guns. Mr. Bly resides in Sewickley, Pennsylvania.